One of the most catchiest points in creation of a spherical panorama is to stich a handheld shot of the place where the tripod stood for the other shots - the nadir. The camera is almost never in the same place as for the other shots. Hence there are parallaxe errors and most probably a different image scale. A Nadir images needs different treatment. If you use one of the GUI front-ends you can load it together with the other images and crop it just the same (if necessary). But don't use it until the rest of the panorama is stitched to your satisfaction: Disable control points usage and exclude it from optimization. I'll give the following explanation using PTGui but this should be applicable to any of the GUI front-ends accordingly. Once you're satisfied with the rest of the panorama on lens settings tab check Use individual lens parameters for the nadir shot(s). Exclude all images but the nadir shot(s) from optimization: On optimizer tab page (advanced interface) uncheck all images but the nadir shot(s) in all parameter boxes and disable global optimization for Fov, a, b, c, shift and shear. Check the nadir image(s) in Yaw, Pitch, Roll and in the individual lens parameters boxes. Warning: If the floor contains regular patterns like floor tiles or parquet don't optimize the nadir image for a, b and c, you might get bent patterns otherwise! In this case make sure the nadir image has the same a, b and c parameters like the other images (on image tab page). 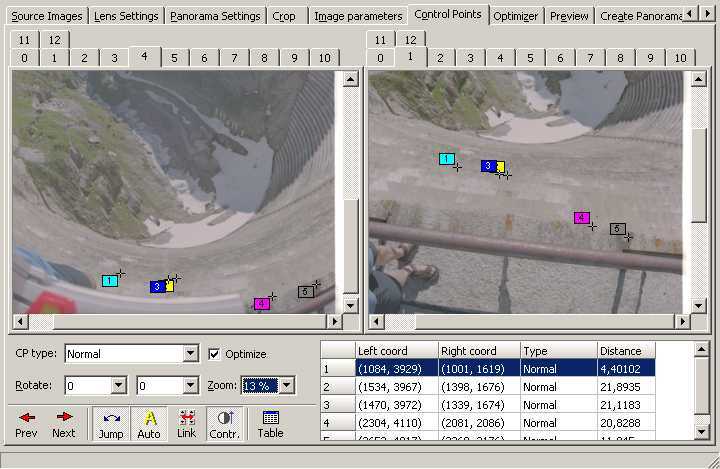 Optimize and check the result in the pano editor. 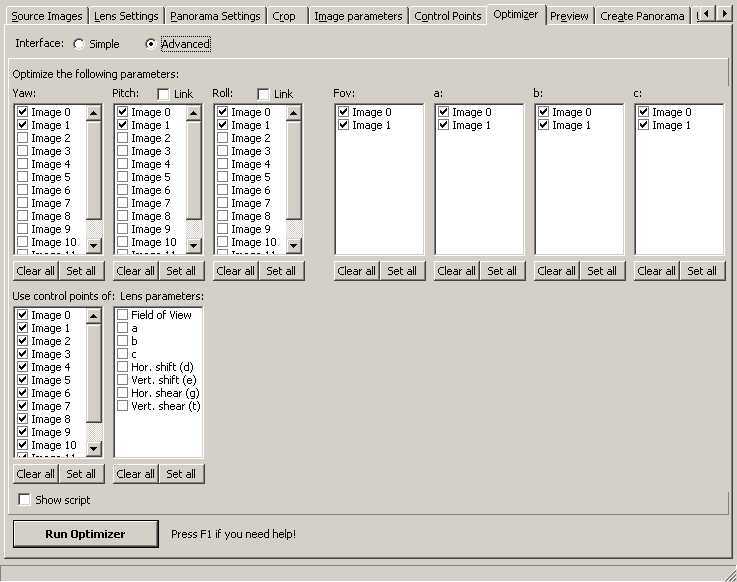 Set more control points and/or check individual shift parameters and eventually individual shear parameters in lens settings tab and optimizer tab if the result is not good. If you can't achieve a good result try to go for one side only - preferable the side with more detail and use some patching techniques to correct the rest. This page was last edited on 22 October 2008, at 21:41.